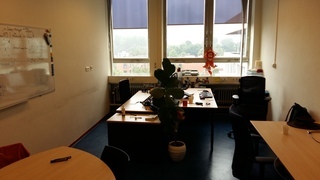 My room at Bioinformatics where I am working with Prof. Jaap Heringa. Me & other members of my former group, the 'Design' group of Molecular Toxicology. A panoramic view of my old room at Groningen State University in the Netherlands. A list of my published scientific articles. A list of my scientific posters. Find literature the new way with the Faculty of 1000 (Biology). Analyzing and (hopefully) predicting protein-protein interactions from sequence information, using coarse-grained and/or automated protein homology-model building at the Bioinformatics Section of the Faculty of Sciences of the Free University with Prof. Jaap Heringa. Modelling of signalling pathways and regulatory networks using Petri-net, a logical modeling formalism from Theoretical Computer Science. Rationalizing and predicting stereo specificity of mutatant enzymes using (amongst others) molecular dynamics simulations, essential dynamics analysis, homology building, automated docking procedures and free energy calculations at the Free University in Amsterdam at the Pharmaochemistry group in the Chemistry Devision of the Faculty of Sciences. This also involves the Chemistry of Complex Molecules project, and the Leiden Amsterdam Centre for Drug Research. Papers published from 2004 till 2008. Hacking away at the Gromacs Molecular Dynamics program package source code. This is a highly sophisticated package featuring a high-performace single and multiple CPU simulation engine that is optimized for most of the current hardware platforms (GROMACS is a recursive acronym for "Gromacs Runs On Most Of All Computer Systems" :-), and various analysis tools, most of which are also fairly well optimized for performance, flexibility and user-friendliness. Contributing several sections to the Gromacs User Manual, mainly on the improved efficiency methods and the many Gromacs Analysis Tool manual pages. Supporting open source (code and standards). Read a vivid plea for both open and (human) readable file formats. Unraveling the riddles and mysteries of Protein Folding and Dynamics (which, in early 2002 has led to my PhD Thesis, 3.9Mb) at the Molecular Dynamics (MD) Group of the Biophysical Chemistry Department at the State University of Groningen (RuG) in the Netherlands. More precisely I am looking at specific features of protein hydrophobic cores which may be vital to a correct folding of the protein. Papers from 1998 till 2002. Characterizing hydrophobicity of insoluble protein-aggregates during a work placement at the Agrotechnological Research Institute (ATO-DLO) Wageningen, supervised by the Biochemistry Department of the WAU. Play tennis in Lunteren (which is close to Barneveld). After having played it way back as a (pre-)teenager, I picked it up again somewhere around late 2004. Used to ride the bike, mostly between Winsum (where I lived) and Groningen (where I worked). The route I took can be traced on a satellite image (90kb jpeg image) I have of the area. Now, I sometimes (only once up to now, due to construction works on the railroad) take the bike from Barneveld (where I live) to Amersfoort (where I continue by train to Amsterdam, where I work). Finding things on Internet. I could ofcourse include a host of links to search-engines here, but I won't because that takes the magic away. Play Dungeons & Dragons (Third Edition) with a group of friends from highschool. We started playing with this group somewhere around 1984 and we still play with the same 4 people who started except for some who dropped out and in in the meantime. I wonder if this would be the last one? And, yes, I saw this film as well, and LOVED IT, leaving me in a state that I could only describe appropriately as flabberghasted... Now I'm waiting for the sequel(s?). O.K. That's about it, if you want or need more info, you can always contact me at feenstra@chem.vu.nl.